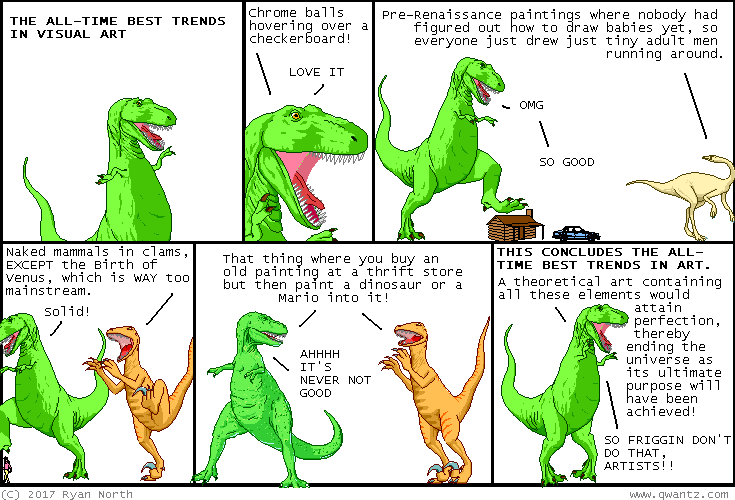 Dinosaur Comics - June 21st, 2017 - awesome fun times! June 21st, 2017: Awesome Con was a great time! Thank you to everyone who came by to say hello: I'd never done a show in Washington DC before and it was really terrific to meet everyone! YOUR CITY HAS AMAZING STUFF IN IT TOO, NOW YOU KNOW. I am Kickstarting a new book! It's called WILLIAM SHAKESPEARE PUNCHES A FRIGGIN' SHARK and/or other stories and it's gonna be great, in my not-at-all-biased opinion!! One year ago today: as a person who definitely experiences emotions, i agree! nothin' better than feelin' an emotion, am i right, fellow humans?? i just love to feel *consults list* "powerlessness".